For four decades, we’ve been celebrating the opening of Trout Season with friendly competition and prizes! The annual Blowing Rock Trout Derby is a much-anticipated early springtime event in the village. We have some of the best trout fishing anywhere in the Southeast, so the combination of the Derby and our lovely springtime makes for a great reason to visit. Fishing is a sport that can be enjoyed for a lifetime and the Derby is a great way to be together as a family! 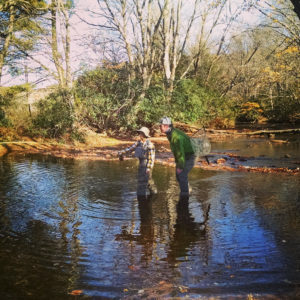 2019 brings the 40th Annual Blowing Rock Trout Derby on Saturday, April 6! Derby hours begin at sunrise on Saturday, April 6, 2019, and end at 4pm on the same day. Catches should be taken to the official Derby Headquarters to enter for measuring. Headquarters: : The Blowing Rock Clubhouse, 108 Lakeside Drive, Blowing Rock, NC 28605. Trout caught in any Watauga County body of water on April 6 are eligible. Prizes are awarded at 4:30pm at Derby Headquarters. Broyhill Lake in Blowing Rock is restricted to fishing by children and persons with disabilities. No fishing license is required for Broyhill Lake. There is a limit of three fish per person from Broyhill Lake. All Fishing and Wildlife laws should be followed for Watauga County public waters, including possession of valid fishing license and following all posted regulations. No entry fees are required and no pre-registration is necessary. 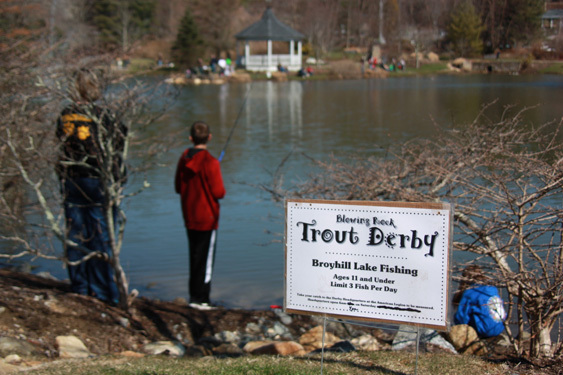 Broyhill Lake in downtown Blowing Rock will be stocked with hundreds of fish in the days leading up to the derby, and other local bodies of water are stocked for the season as well. Kids are especially invited to fish at Broyhill Lake, where some of the stocked fish are tagged for special prizes! Speaking of kids, there’s some great fun for the little ones. The North Carolina Wildlife Commission supports the Blowing Rock Trout Derby with free “Fish for Fun” bags complete with a tackle box, regulation book, bumper sticker, stringer and bobber. Be sure to bring the kids by the Derby Headquarters early for their bags, and to collect an official Derby T-shirt, free! While they’re there, they can create a work of art and compete for the chance to have that art featured on next year’s Event Poster and T-Shirt. Supplies are provided, and all art submissions are hung on the walls inside the Clubhouse (by the Blowing Rock Pool and Broyhill Park parking area), where local judges select the winner at the end of the Derby. Chetola Resort will present an Orvis Endorsed Fly Fishing Demonstration at Broyhill Park from 1:00pm to 1:45pm. This demo is free! Stick around for the Fly Fishing Clinic that starts at 2:00pm, also free. At 3:00pm, kids 16 and under can participate in the Fly Fishing Casting Contest! Kids can try their hand at landing their fly in the targets- and get Orvis prizes! PLUS: Chetola will stock Broyhill Lake with some trophy trout– kids will get a chance to land a big one when they fish at Broyhill Park! Trout caught in any Watauga County public waters on derby day are eligible for measurement and prizes. On the day of the derby grab your fishing license and your fishing gear and hit local waters for brown, speckled, or rainbow trout. Favorite nearby spots include Price Lake, Bass Lake, Trout Lake and the Middle Fork River along Highway 321. **Follow this link and select Watauga County on this map of NC fishing waters to see public fishing areas. Note that Blue Ridge Parkway waters are not included, but fishing is allowed on the Parkway- just obey posted signage. If you want the easiest-to-find public fishing areas, see this High Country Host Guide for addresses of popular Watauga spots! You can pick up a NC Wildlife Regulation Guide from anywhere that sells fishing licenses. Don’t have a license, guide, or tackle? Check out Village Hardware at 312 Green Street in Blowing Rock- they’ll get you all set up! Once you’ve caught your prize-winning trout, take it to the Derby Headquarters at the The Blowing Rock Clubhouse (before 4pm). There, derby staff will measure your catch and record the length. Take some time to browse the prizes inside- there are lots of great items donated by sponsors, usually things like fishing and camping gear, sporting equipment, cash and gift certificates. Prizes and trophies are awarded in five divisions: Men (ages 17+), Women (ages 17+), Girls (ages 12-16) Boys (ages 12-16) and Small Fries (age 11 and under). Fly tying demos with Orvis Endorsed Guide Dustin Coffey! 6-9pm. Fried Trout, hush puppies, cole slaw, French fries, tartar and Cajun remoulade sauces for $14. Chicken tenders and French fries for $7, kids only. Fish and Grits- fresh fried trout over cheese grits, with 2 eggs any style and toast or biscuit for $8.25, offered Friday, April 5 and Saturday, April 6. Fried Trout Basket with slaw, fries, cornbread, tarter sauce for $8.50, offered Friday, April 5 and Saturday, April 6.
on the Trout Derby and overnight accommodations in the Blowing Rock area, contact the Blowing Rock Visitor Center at 828-295-4636 or info@visitblowingrock.com.